"Generation on a Tightrope" — M.L "Cissy" Petty, Ph.D.
October is national book month and I confess to loving real books, the ones made with paper and ink and binding. Perhaps some may think I’m old fashioned craving paper as I do, and yes if you call me out on paper-love I am likely to respond to you on my iPad or Blackberry in less than 30 minutes. I am digitally connected and love scanning Facebook, Twitter and occasionally get side tracked by Pinterest. Connected and scanning on-line are very different than getting lost reading a book. It’s fair to say that I do read on my Kindle but I tend to enjoy the hard back book between my hands most. My Kindle is a part of every trip; I like carrying my library with me. But at home, I like seeing my old friends on the shelf; books that have transformed my ideas about spirituality and relationships; books that illustrate the difficulties of the damned game called golf. I also like underlining and folding pages. I like flipping manually back to a page and re-reading a paragraph without hitting a back or refresh button. Sometimes I just want to sit with an author’s thought without a digital screen growing dark. Two weeks ago a book I’d been waiting for arrived by snail mail. I opened the package and the new book slipped out. As I opened it I heard the spine of the book crack and could smell the pages. It’s akin to walking across your yard after the first snow or like being the first one to open the NY Times saving the travel section for last. There is an absolute freshness to the written word on paper. 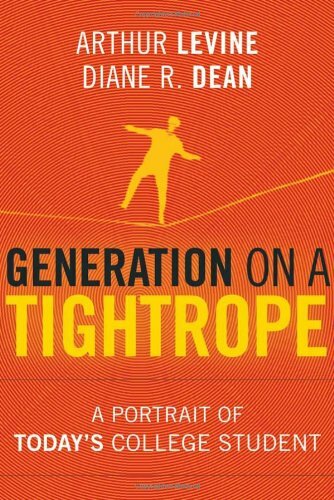 I am just beginning to read “Generation On A Tightrope: A Portrait of Today’s College Student” written by Arthur Levine and Diane R. Dean. Arthur Levine, author of two previous books about college students: “When Dreams and Hero’s Died (1980) and When Hope and Fear Collide (1998), is currently the president of the Woodrow Wilson Foundation and retired as President Emeritus of Columbia Teacher’s College. Dr. Levine has been profiling colleges students based on significant research for over 30 years. His work was important to me during both my master’s and doctoral work. His co-author, Diane R. Dean is the current associate professor of higher education policy and administration at Illinois State University. “This is a portrait of a generation on a tightrope. Today’s college students are struggling to maintain their balance as they attempt to cross the gulf between their dreams and the diminished realities of the world in which they live. They are seeking security but live in an age of profound and unceasing change. They desperately want the economic opportunity their parents enjoyed but are coming of age during a deep recession with reduced career prospects. They want to believe in the American Dream and are optimistic about their personal futures but they are pessimistic about the future of the country. They want to become autonomous grown-ups but seem more dependent on their parents and adults around them than any modern generation. They want intimacy—a partner and a family – but they are isolated, weak in face-to-face communication skills and live in a hook-up culture. They want to play by the rules but they don’t know the rules and the rules are in flux because of the dramatic changes in our economy, the rise of new technologies, the condition of poor public and private institutions, and a world growing flatter. They want to live in an Internet world, a digitally connected globe but the adults and social institutions around them are analog or digital immigrants, including their blackboard universities. This is a generation that thinks itself as global citizens but knows little about the world and acts locally. It is the most diverse generation in collegiate history with the strongest relationships between races but they have limited interest in talking about race or reaching across political or generational divides. So the introduction is done, and now it’s time for me to turn the page.